Here is an example, easy to understand because it is very visual, which will open for you more new doors to the spirit with which the Tarot was encoded. I refer to one of my revelations about the Tarot involving Jacob’s Ladder. 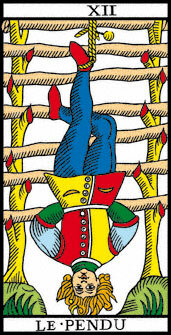 If you look at the card the Hanged Man, you will notice that there are 12 branches that have been cut, with the stumps coloured red. Of course, these 12 cut branches relate to the 12 constellations of the zodiac, but those who are interested in the Tarot tend to stop at this realization since it is always difficult to keep in mind that several teachings can be combined in one drawing. In fact, if you look at the horizontal post at the top of the card, you will notice that it is held up on each side in the intersection of two branches. So I thought to myself that it is possible to add six other horizontal bars, and trying this revealed in the Tarot the seven rungs of Jacob’s Ladder. It appears obvious now that the key has been revealed, yet it had eluded generations of seekers. The 7 stages of this ladder are the seven steps of initiation, corresponding also to the seven chakras. This ladder lets the disciple be uplifted towards heaven to become a living Sun. Look at the fifth column of the Camoin Diagram consisting of from bottom to top The Pope, The Hanged Man and The Sun. First notice that The Hanged Man is placed precisely under The Sun. Notice also that The Pope and The Sun are both composed of two small figures below and a large one above. Indeed, The Sun has a face and is thus a living Great Spirit. The Pope, by climbing Jacob’s Ladder, is transformed into the living Sun. We have here a confirmation. 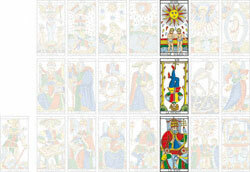 One must place the 21 Major Arcana in the positions of the diagram to discover the symbolism. Moreover, these 7 stages symbolize also the spiritual hierarchy of God, who has always been related to the Sun. In the Tarot, this hierarchy is precisely shown by The Pope and his disciples. The Pope is positioned under The Hanged Man. Even more powerfully, we can find a ladder with seven light blue rungs behind the head of The Pope between the two pillars. Just as in The Hanged Man, there are two pillars (the two columns) and seven rungs. Right at the top of the crown of The Pope, there is a small orange ball which precisely symbolizes the Sun, confirming that the supreme goal of the Pope is the Sun, the Logos, the Christ. This ball is simultaneously at the top of the seven-rung ladder and at the top of the crown, which confirms what we have seen when studying the 5th column. We have just seen that there is a total accord between the symbolism of Jacob’s Ladder and the 5th column of the Camoin diagram. You will see in my teachings that there is also a connection between this 5th column and the two symbolic pillars of the Temple. It should be noted that the symbolism of the ladder is already present in the sack held by Le Mat, but with 9 stages instead of 7. The bottom of the Wheel forms a ladder of two rungs. References to dualism are ubiquitous in the Tarot; here there is a connection with the two animals of the wheel.